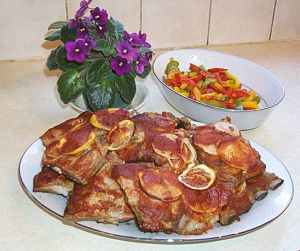 Cut spare ribs into serving sized pieces. Place in large dutch oven, and add water just to cover ribs. Add 1 tsp. salt. Bring ribs to boil, skimming any foam that rises to the top. Reduce heat and simmer for 45 minutes. Meanwhile, prepare BBQ Sauce. Thinly slice onion and lemon. Spray bottom-part of broiler pan (or other large deep pan) with PAM to ease clean-up. Layer ribs in broiler pan, sprinkling onion and lemon slices over the ribs. Baste each layer with BBQ Sauce. Bake at 350 for 45 minutes. Place on platter and serve.